iPhone alarm not working after iOS 11 or iOS 12 update? This guide will tell you how to fix alarm not working in iOS 12, iOS 11, as well as in iOS 10. Nowadays, most of us would use the alarm clock function of phone instead of a real physical clock. For iPhone users, the Alarm function of Clock app is very convenient, and in iOS 11 and iOS 12, Apple even added Bedtime Wake Up Alarm to iPhone. However, some users say that the alarm not working after updating to iOS 11/12. Which is quite annoying, especially for someone who have to get up early in the morning. 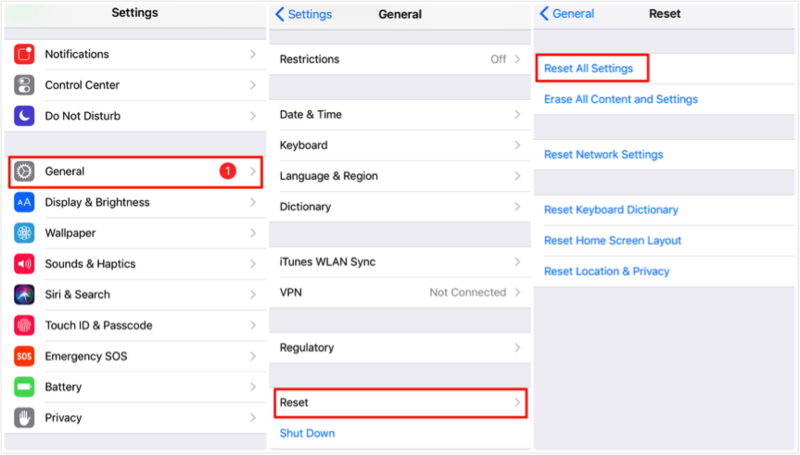 To help you out, here in this guide we will tell you how to fix iOS 12/11/10 alarm not working issue on iPhone iPad. Let’s get it on. First make sure you have turned Mute switch off, then check whether the sound volume is loud enough to wake you up. Go to Clock app > Tap Edit > Choose one alarm > Tap sound to check. Some third-party alarm apps may conflict with the stock Clock app on iPhone, so you can delete those apps to see if it works. First delete all the alarms and close the app. Then open it again to add your alarms. Some users have fixed iPhone alarm not working in iOS 11/10 problem by this method. By the way, there seems a bug comes along with the Bedtime feature. It helps people get to bed, but stops them from waking up on time. Some users also report that if the Bedtime alarm is set for the same time as the normal alarm, then both of them seem to go off. Go to Settings > General > Reset > Reset All Settings to have a try. Restart your iPhone: Press the wake/sleep button and then slide to power off. Reboot your iPhone: Press and hold down the Home button and wake/sleep button until the Apple logo appears. For iPhone 7 users, you need to hold on Home button and Volume down button. First restore your iPhone from backup to have a try, if it does not work then restore your iPhone as new. Remember to backup your iPhone in advance. Go to Settings app > General > Software Update to see whether there is a new version. the new version of OS may be helpful to fix the bug. That’s all for how to fix iPhone alarm not working in iOS 12/11/10. Hope this guide can help you. If you have some new ideas, please share with us in the comments column.